RBTH presents a selection of views from leading Russian media on international events, featuring reports on the UN resolution imposing an arms embargo against Houthi rebels in Yemen, and the situation in Ukraine, where Kiev has named its conditions for talks with the rebel “republics” in the east, as well as analysis of the potential effects on Russia of a delay in lifting U.S. sanctions on Iran. 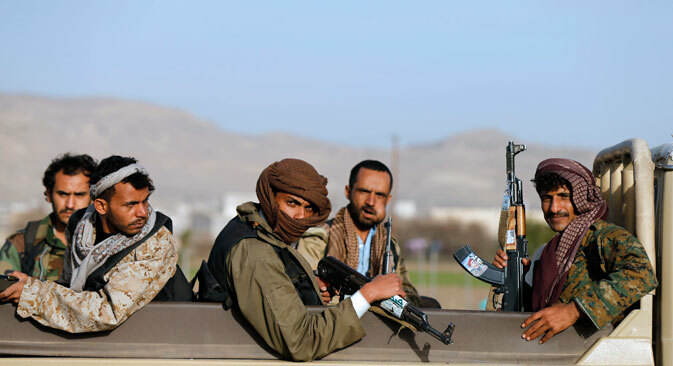 The weekly business magazine Expert reports that the UN Security Council has adopted a resolution against the Houthis – the Shiite rebel movement that controls a substantial part of Yemen and is fighting the country's official government, the Arab coalition and Al Qaeda. The document includes the freezing of Houthi assets and a ban on supplying them with arms. Furthermore, individual sanctions have been imposed on insurgent leaders, along with demands for the Houthis to immediately withdraw their forces from the occupied Yemeni cities. Expert writes that the Gulf states have already called the resolution a diplomatic victory since the document helps them intensify their pressure on the Houthis and partially legitimizes their current military operation against the rebels, led by Saudi Arabia. At the same time Russia's position appears to be quite distinctive. Russia had demanded an arms embargo not only on the Houthis but also on the Yemeni government. Nevertheless, in the end Moscow decided not to veto the resolution but abstained from voting in the hope that "the adopted resolution will not be used for the future escalation of the conflict." Some experts are recalling the Libyan precedent: Back then Russia also opted not to block a UN resolution [calling for a ceasefire, imposing a no-fly zone and tightening sanctions against Libya’s leadership – RBTH], hoping that it would not be used to overthrow Libyan dictator Muammar Gaddafi. The Moskovsky Komsomolets tabloid newspaper writes that Kiev will be ready to begin talks with the representatives from the unrecognized rebel “republics” of Donetsk and Lugansk in the east of the country only after the regions hold elections according to Ukrainian legislature. The announcement was made by Ukrainian Foreign Minister Pavel Klimkin, who underlined that the elections must take place under the observation of the OSCE (the Organization for Security and Cooperation in Europe) and their results must be accepted "by all international organizations." In turn, self-proclaimed Donetsk People's Republic envoy Denis Pushilin accused the Ukrainian government of delaying the realization of the Minsk Agreements, the multi-point peace accord aimed at reaching a comprehensive settlement of the conflict in the Donbass region of eastern Ukraine. Pushilin called on the European Union to put pressure on Kiev in order that the Ukrainian government "take concrete actions," writes Moskovsky Komsomolets. Meanwhile, Lugansk envoy Vladislav Deinego has accused Kiev of aggravating the humanitarian situation in the Donbass. Deinego said that the Ukrainian government is consciously refusing to create working groups to resolve the economic and social problems in the region. The centrist newspaper Nezavisimaya Gazeta reports that the U.S. Congress will have 60 days to evaluate the agreements and decisions made concerning the removal of sanctions on Iran. During this period Barack Obama's administration will have little room for maneuver regarding the canceling of the sanctions. Meanwhile, the Russian government has announced that the restrictions on the supply of S-300 surface-to-air missiles are being removed from the Islamic Republic, a move that has been criticized by the U.S. and Israel, Iran's eternal opponent in the region. Disagreements between U.S. politicians are complicating the conclusion of a final agreement on Tehran’s nuclear program and the delay in canceling the sanctions may harm Russian interests. "With the cancelation of sanctions, Moscow will be able to actively start the modernization of [Iran's] oil and gas sector," Nezavisimaya Gazeta cites Senior Collaborator at the Russian Academy of Sciences’ Institute of Middle East Studies Vladimir Sazhin as saying. "This sector requires large-scale investments. If in the next five to seven years it is not modernized, Iran will be forced to buy oil and gas from other countries." Sazhin also remarked that Russia's military-technological cooperation with Iran is also impossible without the cancelation of the sanctions.